This is the text of the poster which I’m presenting at the HERDSA 2013 conference today. Our digital native students may be able to use technologies, but that does not mean they can learn from them. Being able to read and write never meant you could therefore learn from books (Laurillard, 2013, p. xvii). Many university students can operate comfortably in the space of digital networks but they need help in learning how to make them places for learning. A design research study developed and refined an interactive website based on Lipman’s (2003) community of inquiry theory to support this learning. 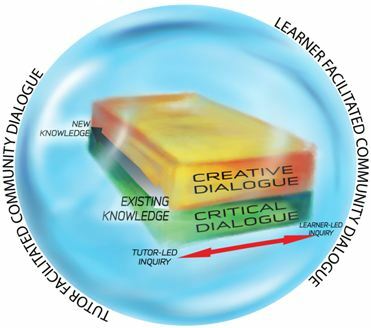 It was found that the caring dimension was fundamental to the flourishing of the critical and creative dialogue necessary for the development of higher order thinking. This design research project used community of inquiry theory to develop a means of helping students to learn through social media. The most commonly-used version of this theory (Garrison, Anderson, & Archer, 1999) has been criticized as ineffective (Rourke & Kanuka, 2009). However, Wegerif’s (2007) version of Lipman’s (2003) original community of inquiry model brought its dialogic elements to the fore in ways which were directly relevant to the facilitation of inquiry online through synchronous or asynchronous media. A community is generally thought of as made up of people who have something in common, and in a community of inquiry it is the inquiry itself which holds it together. As applied to tertiary education, Wegerif’s community of inquiry might be seen as an example of a “rational community” (Biesta, 2004) in that its members are expected to engage in, or develop, the “serious speech” associated with the professions which the students hope to join. However, an online community in a formal educational setting is an artificial thing. In a university, an online learning community is made up of people who have come together not necessarily voluntarily through some identified common interest, but as a result of their involvement in a course or programme. As a result, not all members have necessarily learned the language and thought processes of the dominant discourse. Those with different backgrounds may be “strangers” in the community. Strangers in this context “are those who do not fit the cognitive, moral, or aesthetic map of the world” (Bauman, 1995, p. 200 quoted in Biesta, 2004). Such a community of inquiry must make space for the people “who have nothing in common” (Lingis, 1994) within the rational community, and this requires a different view of dialogue, a different power structure. In Lingis’s “other” community there may be no shared axioms, no shared discourse, or only a partial overlap. In a dialogic learning community it is important to build a shared language, but if the learning in this community is to be for the 21st century, the shared language must not be only that of the dominant group, since this merely perpetuates the power structures and thought patterns of the élite. The findings of the first iteration of this research study illustrated the importance of exploring the nature of the shift of control over an inquiry from tutor to students, so Wegerif’s model was redrawn to encompass the two dimensions of control over the inquiry and disciplinary understandings of knowledge provided by the Sheffield IBL model (Levy, Little, McKinney, Nibbs, & Wood, 2010; Levy & Petrulis, 2012); and reflection on the findings of all three iterations, supported by the work of Davey (2006), led to the encompassing of critical and creative dialogue within community dialogue. Although the model became increasingly complex in the course of the research study this complexity did not need to be replicated in the artefact. Initially, tutor support was provided through a blend of workshops and mentoring, in order to identify collaboratively the most effective facilitator cues for stimulating critical, creative and caring dialogue. Once these had been identified the support material was streamlined in the form of “macro-scripts.” The word macro-script appears to have originated in the field of computer programming, where it has a highly specialised definition related to the kind of code it is. In the context of pedagogy, a macro-script has conventionally been a tool such as SWOT analysis, or Belbin® team roles. In this project the macro-scripts took the form of sets of open questions, which were derived from the literature on communities of inquiry, dialogic learning and inquiry-based learning, as well as from online help sites. These can be found at http://www.dialogicinquiry.net/ and the page called Dialogue contains the macro-scripts. On the left float the three types of talk which can occur in a dialogic inquiry: critical talk, creative talk and community talk. Clicking on one of the “talk” labels causes a number of macro-script titles to spring out from it. Clicking on another causes them to disappear and a new set of macro-script titles to spring into view, and clicking on one of the macro-script titles causes the questions in that macro-script to appear on the right hand side of the screen. All sources have been used/adapted in good faith and the site has a Creative Commons attribution, non-commercial, no derivatives licence. The site is intended to be self-explanatory as far as possible so users can make use of those aspects of the site which are relevant to their inquiry. It is not intended that anyone should use all of them, they are a resource. However, if dialogic inquiry is central to a programme, the site could be used systematically, with different macro-scripts embedded in different courses. Davey, S. (2006). Consensus, caring and community: An inquiry into dialogue. Analytic Teaching, 25(1), 18–51. Garrison, D. R., Anderson, T., & Archer, W. (1999). Critical enquiry in a text-based environment: Computer conferencing in higher education. The Internet and Higher Education, 2(2-3), 87–105. Laurillard, D. (2013). Foreword to the second edition. In Rethinking pedagogy for a digital age: designing for 21st century learning (2nd ed.). Abingdon, Oxon, UK: Routledge. Lingis, A. (1994). The community of those who have nothing in common. Bloomington, IA: Indiana University. Lipman, M. (2003). Thinking in education (2nd ed.). Cambridge: Cambridge University Press. Mercer, N., & Hodgkinson, S. (Eds.). (2008). Exploring classroom talk. London, UK: Sage. Mercer, N., & Littleton, K. (2007). Dialogue and the development of children’s thinking: A sociocultural approach. London, UK: Routledge. Rourke, L., & Kanuka, H. (2009). Learning in communities of inquiry: A review of the literature. Journal of Distance Education, 23(1), 19–48. Wegerif, R. (2007). Dialogic education and technology: Expanding the space of learning. New York, NY: Springer. Wegerif, R. (2010). Mind expanding: Teaching for thinking and creativity in primary education. Maidenhead, UK: Open University.